Derm Defense! Take a “Bite” Out of Allergies! Everyone knows someone with hay fever. Airborne pollens, molds, dust particles, etc. are inhaled and soon the sneezing and sniffling begins. What you may not know, is that pets can suffer from allergies too! Does your dog constantly lick their paws or shake their heads? Have you noticed them scratching or rubbing on things? Are they losing hair or does their skin look red, thickened or have an odor? 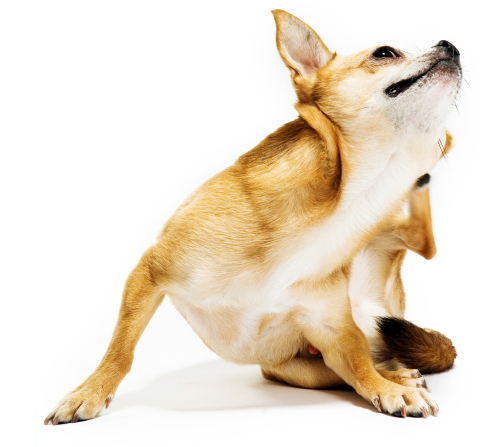 Then your dog may be suffering from Atopy or Chronic Itch. A simple way to think of atopy for pets would be simply saying that the pet inhales an airborne allergen but instead of sneezing and sniffling, the pet gets itchy skin. In fact, the situation is probably far more complex. The allergen is not only inhaled but is in contact with the skin and it is no longer considered accurate to think of atopy as an inhaled allergy. Exactly how we get from particles floating in the air to itching and scratching is not entirely understood but the important issue is that the allergen comes from the air. Airborne particles (pollen, dander, etc.) are harmless to someone who is not allergic to them. Allergy develops in individuals who are genetically programmed to do so. There are many types of environmental allergens that surround us and our pets each and every day including flea bites (even just one), pollen and even the dust in our homes. For some dogs these allergens can lead to a skin condition that makes them itchy which leads to scratching, sometimes excessively and can damage the skin. This is unpleasant for your dog and can also be difficult for everyone else in the family. Some dogs will suffer from seasonal itch but after years of seasonality the itch can start to last longer until finally it is a year round problem. This is true in about 80% of dogs with seasonal allergies. In dogs, seasonal allergies usually start early between the ages of 1 and 3 years. Breeds predisposed to develop atopy include (but are not limited to): Dalmatian, Golden retriever, West Highland white terrier, Shar Pei, Labrador retriever, Cairn terrier, Lhasa Apso, Shih Tzu, Boxer, and Pug. In the past, the only way to manage atopy was through medications such as antihistamines and steroids but Hill’s nutritionists and veterinarians have developed a new Prescription Diet® specially formulated to help manage environmental sensitivities in dogs. Derm Defense™ is the first and only nutrition formulated to reduce signs of environmental allergies by disrupting the internal allergy response and creating a barrier against future episodes. Holistic long-term solution supporting healthy immune system and continuously normalizes the body’s immune response to allergens. Derm Defense has been created to help manage non-food related skin conditions. 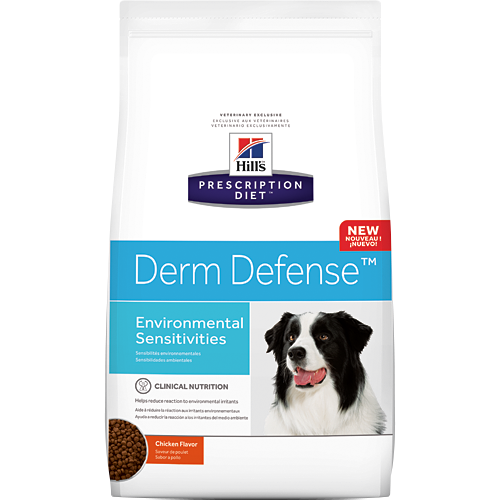 Like with all of our prescription diets, Derm Defense has a palatability guarantee—this means that if your dog does not like it, you can bring it back for a full refund. Please note that when first starting the diet, it can take anywhere from 6-8 weeks before you see results while the body responds to the diet and the skin restores its protective barrier. If you would like more information about Derm Defense, contact the clinic at 281-282-9944.